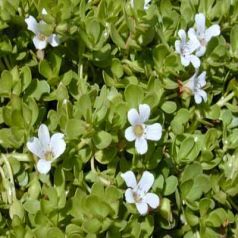 Brahmi is a perennial creeping herb with white flowers related to snapdragons. It grows floating in tropical marshes and wetlands. It has been established as a powerful nerve and brain tonic. It has a reputation for increasing intelligence, longevity, and circulation in the brain, by improving both short and long term memory. Brahmi is available in tablet form and in ayurvedic medicine it is used as a rasayana which mixes it with honey and spices. The effectiveness is increased if taken with B-vitamin complex. Adults should take 3000mg 1-2x/day and it may take up to 4 weeks to get the full effect. Alzheimer's, ADD, Memory loss. Increases new protein synthesis in regions of the brain for long term memory. Neutralizes free radicals in the brain, has a calming effect in ADD and ADHD. Reduces errors, improves acquisition and retention of learning. Anxiety disorder, stress. Induces a sense of calm, reduces internal restlessness. Irritable bowel syndrome. May calm IBS, especially if diarhhea is predominent symptom. It is important to remember that Alzheimer's is a disease with a full range of signs and symptoms. In fact, late stage Alzheimer's can start looking like Parkinsons disease with stooped posture and tremor in the hands. The earliest symptom of Alzheimers is memory loss or demetia. Demetia is just a medical term for memory loss and it occurs with a variety of conditions. Like all treaments for memory and Alzheimers, brahmi may prolong memory but it most probably will not prevent the progression of the disease. It will just slow it down and when taken with medications such as Aricept and Namemda, can prolong the time that someone can live at home. And after all, isn't that the real goal..independence as long as possible? Brahmi is best taken twice a day in the morning and mid afternoon. Works well with ginko and lecithin which boost circulation. May interact with estrogen, so do not use if taking birth control pills, or estrogen replacement therapy as the interaction may result in temporary hearing loss.